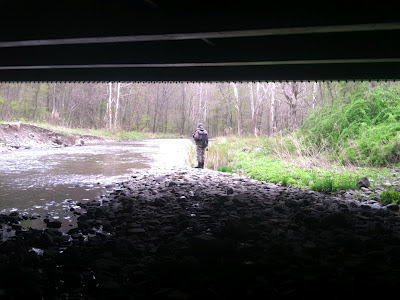 H: April 28, 2012: Friday, I took a day off from work to fish with my buddy, John. I was this close to cancelling as the forecast called for rain the night before, frigid temps, and gusting winds. My gut told me it wasn't going to be a very good fishing day. Hell! Any normal/sane person would have been able to deduce that. John said I should "man up" (not exactly in those terms... ; ). Against my better judgment, my flygirl instincts, I decided to go. I truly am a fly fishing masochist. Under the bridge. Read's Creek, East Branch of the Delaware. We met up at the Roscoe Diner and enjoyed a hearty breakfast before heading out to fish the East Branch of the Delaware. We started out by Read's creek. Swallows were gracefully feeding in the middle of the river. Snow was falling sideways, propelled by 25-30 mph winds. Bitterly cold, John commented that it felt like the Salmon river, not the Delaware. We took a break and drove to a nearby gas station for some hot coffee to warm up. From there we decided to head over to Jaws. But as we're walking over the bridge we both spot a fish jumping out of the water below. It does this twice. I don't know why John even bothered to ask if I'd rather go down there, instead, and try to catch this fish. Uh, does an adult mayfly have wings? ; ) We turned around in pursuit of our quarry. 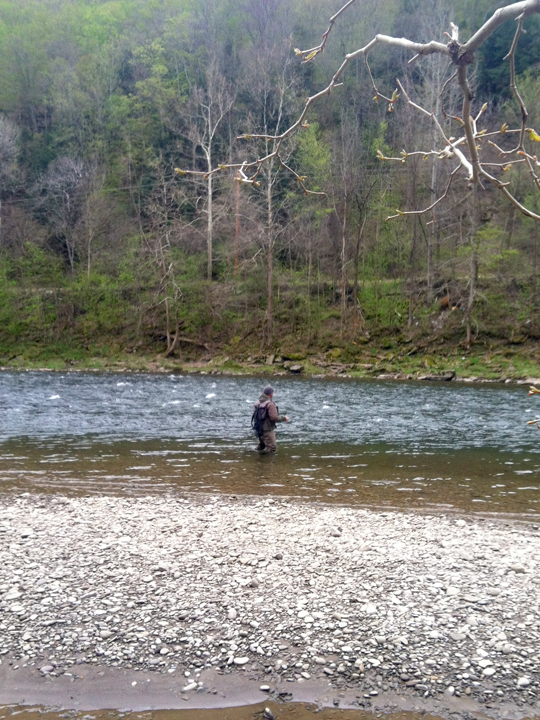 John, the machine, on the East Branch. Well, to make a long (and very cold!) story short, we went down there and gave it our all, again. The swallows were still at it. The wind was still blowing hard and it might have been 3(?) degrees warmer than earlier that morning. We never saw that trout again or any other, for that matter. I guess the fish were hunkered down, not yet acclimated to the higher water levels. On the walk over, I was charged by a protective gander whose mate was nesting on a nearby island. We had given her a wide berth as we waded by. We were well downstream of her when out of the blue, Mr. Goose swooped down and mock charged in full wingspan, landing perhaps 10 feet away from me. He had been guarding the channel on the other side of the island and didn't see us till we were below the island. His timing was a bit off, but it was still quite an impressive display! That was the most excitement we had all day. As we walked up into the Beaverkill, we saw a massive flotilla of bugs on the water—majestic March browns, numerous caddis, tiny olives... But not a fish to be seen or heard. We caught a few (bugs) on the tips of our rods. John landed a gorgeous March Brown. I landed the 2-for-1 special, a small bwo piggy backing on the wings of another larger mayfly. It's now around 4:45 pm. John has to report to work by 6:30 pm and he hasn't eaten anything since breakfast. I know he still wants to fish, but I do what any good fishing buddy of his needs to do—call it!—drag him away from the river. We grab a late lunch/early dinner at the Diner. My stomach is full. I'm nice and warm. I'm debating whether to go back out and fish till dusk. But as soon as I walk outside and the first few flakes of snow hit me, I come to my senses. The swallows had a killer day on the river, unlike us. They pretty much had the mayflies all to themselves. 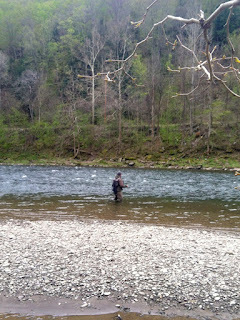 I still had fun—the company was good, I fished new water, and John gave me a really cool wading staff he found by the river (I believe it's sycamore). But next time, forget about "manning up." 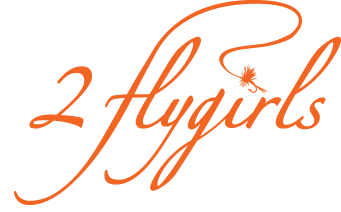 I'm going to trust my flygirl instincts.